Sushi have taken the world by storm and Distrita continues to deliver awesome Food Recipes. These tapas alike dishes from Japan is easy to eat and is really healthy for humans stomach. Here we at Distrita Food Recipe team we give you a basic recipe that is easy to make. Also we bring you an excellent guide for easy way to prepare sushi. This sushi recipe got roll that has smoked salmon, cucumber strips and avocado on the awesome tasty sushi bites. Preparation of Sushi isn’t easy for beginners. You need to have at least 39 mins available! Soak the rice for 4 hours. Drain and cook in an electric rice cooker with 2 cups of water (see note). The rice should be a bit dry since vinegar will be added later. Immediately after the rice has been cooked, add the rice vinegar to the hot rice. Spread the rice on a large plate to cool completely. Place 1 sheet of seaweed on a bamboo mat and add a thin layer of cold rice on the seaweed. Leave a space of at least 1.25 cm free on the top and bottom edges of the alga so you can seal the roll more easily. Distribute a bit of wasabi on the rice. Arrange the cucumber, avocado and salmon over the rice. Separate them about 2.5 cm from the bottom edge of the roll. Moisten the top edge of the alga a little and start to roll up and down with the help of the bamboo mat, making sure the roll is tight. Cut the roll into 8 pieces of the same size and serve. Repeat the procedure to prepare the rest of the rolls. If you do not have an electric rice cooker, check out the recipe for the perfect rice for sushi. Correct making of the rice is essential for sushi. 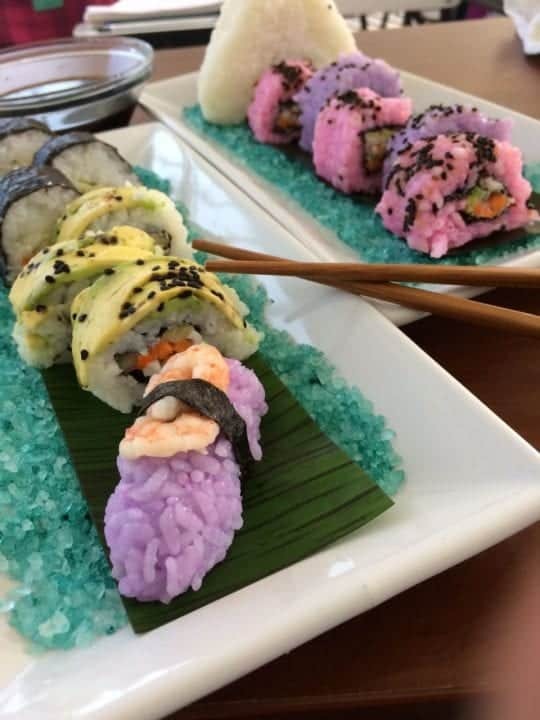 It should be sticky so you can easy roll and put the different sushi ingredients on top. Just remember that sushi doesn’t need to be fish. It can be anything! Also when such is rolled and cut the name is Maki sushi. We at Distrita hopes that making sushi isn’t to difficult, but you will need to have some free time to do so. It is also a very social dish to make with children or with friends. We wish you bon appétit!